At BlizzCon’s Future of StarCraft II panel, we found out more details of the mission packs to be released after Legacy of the Void and how tournament play will evolve. Lead game designers from the StarCraft team spoke of how they are revamping the tournament ladder system, and how co-op play fits into the new vision for Blizzard’s RTS. The panel, hosted by major members from all areas of the StarCraft development team, detailed how Blizzard aims to support their franchise once StarCraft II’s story arc concludes in the final expansion releasing next week. 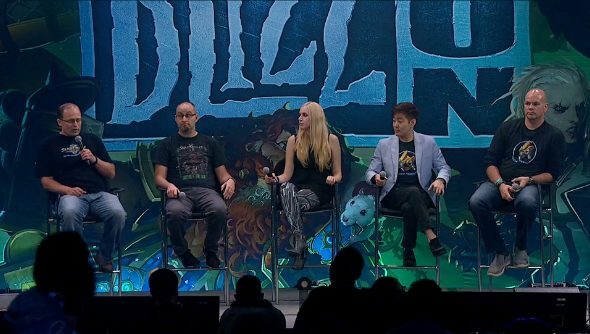 From a story perspective, writer Valerie Watrous highlighted the mission packs, mentioned during the opening ceremony of BlizzCon. Nova Covert Ops will be the first of a three-pack story arc spanning nine additional missions. This first one, focused on the Terran Ghost Nova, takes place some years after the epilogue of Legacy of the Void. Emperor Valerian has taken over as leader of the Terran Dominion, and as a far more compassionate leader than his father, has reinstated many freedoms and liberties that were outlawed. As freedom of the press returns, some unforeseen ramifications cause opponents to criticise him for showing weakness in allowing this, which costs him some of his power. As opponents begin to undermine him, Valerian worries that they are creating secret alliances behind his back, one of which is the Defenders of Man, a group dedicated to protecting Terrans from alien races. This is where Nova comes in, as she wakes up in a Defenders of Man facility and has to discover what they have planned, while the Dominion must try to find their top Ghost. Jason Huck, lead game designer for the mission pack, detailed some of the mechanics for Nova Covert Ops and other mission packs. Nova will be a playable unit, leading her black ops forces through the missions which will involve “nuking the crap” out of lots of things. Sounds very black ops, sure. Nova’s unit can also be equipped with multiple different weapons and grenades in equipment slots. Alongside these larger content packs will come micro content packs, such as unit skins. New looks will be coming on a unit-by-unit basis after the release of Legacy of the Void and will continue in the vein of the ones included in the special pre-order edition of the game. Voice packs will also be coming, including Abathur telling you that your ‘mineral quantitites are insufficient’. To help Blizzard with the monolithic task of continuing to add content to such a well-farmed series as StarCraft, the in-game user-generated content portal Arcade is getting a UI overhaul. It should include more features, and they’ll continue to run more contests like the WarCraft 3 assets contest concluding this month. Blizzard are also aiming to introduce the first initiative to pay content creators using Arcade by curating contributions. As for StarCraft’s multiplayer experience, with an e-sports following as large as it has, it’s a no-brainer that Blizzard will be focused on supporting the franchise well beyond the two year mark. Lead designer for multiplayer, David Kim, detailed some of the changes they will be making in a total ladder revamp after LOTV’s release. In order to increase the meaningfulness of ranks, separate MMR will be implemented per race in ranked matchmaking, with the possibility of also extending that to unranked play too. This is to allow players to try their hand at multiple races without having to sacrifice the rank of their main. As far as supporting the competitive side of StarCraft, Kim also said that map and balance updates would be issued every season, but that the team would also be looking at bigger changes like the possibility of introducing or removing units entirely. Kim said this was to help combat a stale meta, or to get around unforeseen unit combinations that make one race particularly powerful, like Swarm Hosts in Heart of the Swarm. The automated tournament system will also be updated to support Archon Mode and 2v2 tournaments, just as it does with 1v1, to promote more teamwork-oriented play and a more social experience. To go along with this, Matt Morris, lead campaign designer for the co-op side of Legacy of the Void, outlined some more details on the new mode, formerly known as allied commanders. In the co-op missions, players will choose a leader from one of seven, including Raynor and Kerrigan, with extra commanders being added in the future. The first of which, Phase-Smith Karax, is a Protoss engineer working in the weapons bay of an orbital platform. As a result, many of his specific commander powers involve calldowns dealing massive damage to enemy units. To continue to support co-op post launch, the team are also looking at new missions including maps and modes like capture points, which they hope will improve communication as players have to rely on their partner to prevent points being recaptured.